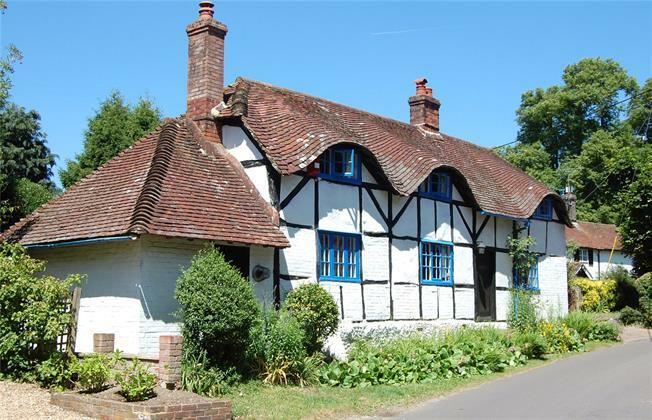 3 Bedroom Detached House For Sale in Alton, Hampshire for Guide Price £655,000. A Grade II Listed house of immense character, believed to date from the 17th Century, standing close to the heart of the village in gardens and grounds of about a third of an acre. The house takes full advantage of the features associated with a building of this period and now provides a very interesting home whilst still retaining all of the inherent character of the original building. There are a number of period features throughout including exposed beams and timbers, old latch doors and a fireplace in the sitting room. Many of the rooms have the benefit of a dual aspect and are larger than first anticipated. The generous living accommodation is very flexible and includes a double aspect sitting room with double doors opening out to the garden, dining room and family room. The accommodation is complemented by a kitchen/breakfast room with a full range of cream fronted cabinets and appliances including an electric oven and hob. There are three bedrooms to the first floor as well as a flexible study / fourth bedroom and bathroom to the ground floor. This is a very appealing home of great character standing close to the heart of this traditional Hampshire village. The active village of Upper Farringdon is set amidst fine Hampshire countryside between the villages of Chawton, East Tisted and Worldham within the South Downs National Park. Together with Lower Farringdon the village has an active community with two public houses and church. Upper and Lower Farringdon are in an enviable position allowing for a number of country pursuits. Of note, there is a primary school and further public house in Chawton. The historic market town of Alton has a good range of high street shops, weekly and specialist markets, senior schools, further education college, Alton convent, sports centre and mainline railway station to London Waterloo. The property stands within attractive landscaped grounds providing a beautiful setting with areas of lawn together with well stocked flower and shrub borders, variety of young and mature trees and vegetable garden together with a poly tunnel and green house. A paved terrace provides an ideal outside seating area and overlooks the garden. A private driveway provides ample parking and access to the garage with twin doors. The garage is currently partially converted to allow space for a workshop. This could be removed if required. Timber shed. Log store.